I recently started shooting in RAW, and I am unable to see thumbnails of any of my RAW CR2 photos in their folders. Your Codec Pack would enable me to see thumbnails of my RAW files without affecting my photos in any other way, right? I would also like to make sure that your software won't interfere with the photo-editing I do using Photoshop Elements 9.0 and Photoshop CS5. 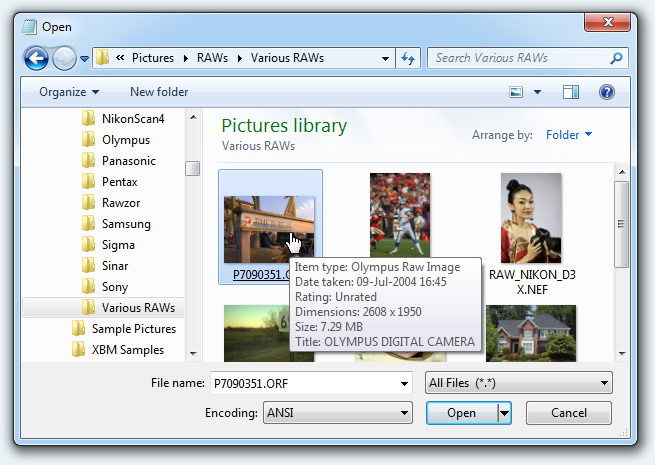 Yes the Codec Pack's purpose is precisely to enable raw support in Windows Explorer. Our codecs are strictly read-only and won't affect your images in any way. Adobe Photoshop and Adobe Photoshop Elements are unaffected by the installation of our Codec Pack. However, in all applications that use the standard Windows dialogs for opening files, you will be able to turn on thumbnail views and see thumbnails in there, just like in normal Explorer folder windows. The functions of Photoshop and its file format support will not be affected in any way, but opening files through the standard Windows dialogs is going to become much easier in nearly all applications, including Photoshop!